Coconut sugared popcorn made in a Whirly Pop is a favorite treat at our house; our kids and their friends love it! 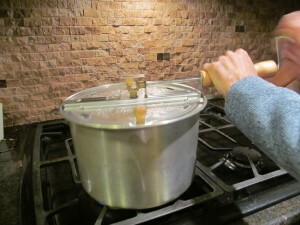 The Whirly Pop is one of my favorite cooking gadgets ever. Yes, it is a rather flimsy “sold on t.v.” type of product, but no matter. It does what it is supposed to do; it makes great popcorn~in a flash. Before buying a Whirly Pop, I read many of the more than 3,500 reviews here on amazon. Rated 5 stars in most of them, I decided it was definitely a wise purchase. After using the Whirly Pop countless time, I can say it is definitely one of the best purchases I’ve ever made. This recipe for coconut sugared popcorn is hands down my family’s favorite popcorn. My kids ask for it almost every weekend, as do their friends who come over:-) The hint of coconut and salty/sweet flavor are hard to resist. It is addictive! We love coconut oil and use it as often as we can for its health benefits. My favorite is the Carrington Farms that is sold at Costco. Note: I usually make 2-3 batches back to back when we have lots of folks at the house. It isn’t necessary to wash the Whirly Pop between batches. All I do is empty the container of any leftover kernels and swipe the insides with a paper towel. Then, I add more oil and proceed to the next batch. Make ahead: This popcorn keeps well for a day or two if stored in an airtight bag. My kids take leftovers to school for snacks, and when I make big batches for a party, I often make them early in the day. 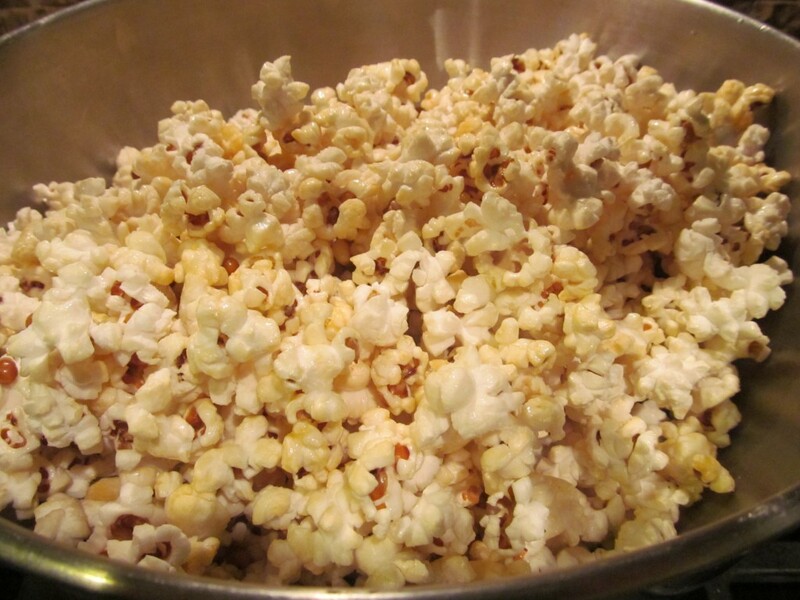 If you have a Whirly Pop, I would love to hear some of your favorite popped corn recipes! We are kind of stuck on this favorite but would love to try something new:-) As always, thanks so much for stopping by. Be blessed, and stay savvy!!! Hands down some of the yummiest popcorn you'll ever eat! Place popcorn kernels, sugar & coconut oil in Whirly Pop. Heat Whirly Pop over medium high heat, turning crank continuously. Continue turning crank until all corn is popped. Empty popped corn into large bowl. Sprinkle with salt to taste. Let cool a minute or two before eating so that sugar will harden on kernels. Kay, that is so awesome that you got your W.Pop at an Ace! I love small retailers:-) We love using coconut oil, and I am hoping to wean us off of the sugar. #muchhealthier Thanks for your comments!!! Hi Jenn! I’ve never seen the Whirly Pop at my Target, but that is good to know info for sure!!! I’ve heard good things about WF organic; I want to try it! Thanks so much for sharing!!! Several years ago I went to every store in town looking for a thin pan that would fit on my stove burner – not too big to extend past the burner. I finally went into a small Ace Hardware and told the lady what I was looking for. (I had this type pan before but with age it had gotten bent and did not sit flat anymore) Anyway, she didn’t have one, but mentioned they had a Whirley Pop. I love it! Our favorite is made with coconut oil, but I don’t add the sugar. Gail, it really makes the best popcorn ever, and I don’t know how I lived until now without hearing about it! Sur La Table sells this for $29.95, so amazon.com or BB & Beyond are better bets. Will head to Western to try The Amish Country popcorn. Try the coconut oil–it is amazing! Thanks for sharing!!! Jamie, just now have seen this post on The Whirley Popcorn Popper. I have been using one for years. Laura Gail & Steve think I make the best popcorn and I do. The Whriley Pop is like a cast iron cook pot it becomes seasoned with time & use and will last many years. Just to let you know Sur La Table at the Summit carries the Whirley Pop but can’t remember exactly the price but pretty sure it is close to what you paid. I have not used coconut oil but use peanut oil since you need an oil with a high smoking point. I have found the best popcorn is “The Amish Country” popcorn, it has no G.M.O.’s. She can get it at Williams Sonoma, but I am now buying it at Western in Mountain Brook since it is cheaper there. Western has it in yellow and while corn. Highly recommend this corn and the Whirly Pop to anyone wanting delicious and healthy popcorn.